Martha Berry asks Dr. Tucker to send her his hay fever & asthma cure for the $0.50 she encloses. 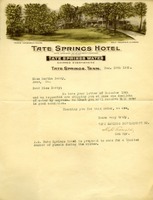 Martha Berry asks Ernestine Robeson to let her know when Mrs. Underwood will be coming to Tate Springs as she would like to talk with Mrs. Underwood about purchasing Tate Springs. 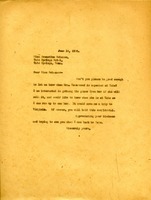 "M.B." 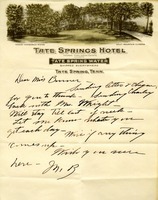 writes to Bessie Bonner from the Tate Springs Hotel that she is "sending Charley back with Mrs. Wright" but will herself stay until the end of the week. 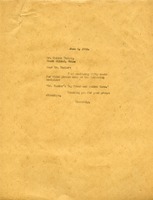 She asks Bonner to let her know "what you get each day" and to write if anything comes up. 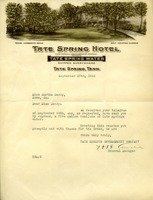 She signs the letter "wish you were here." 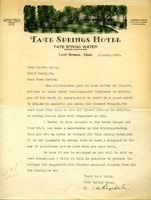 The Company sends Miss Berry 5 gallon demijohn of Tate Springs water by her request.